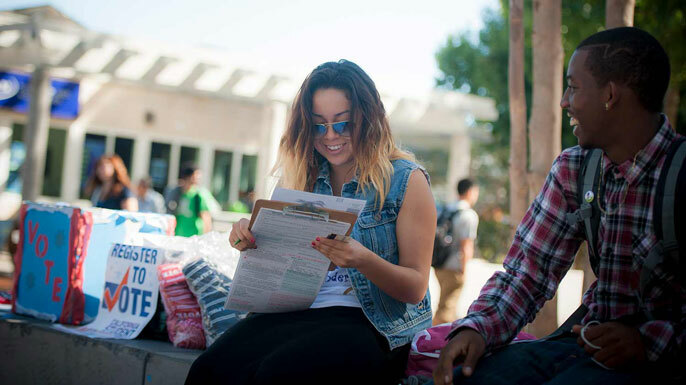 A member of UC San Diego’s nonpartisan Student Organized Voter Access Committee (SOVAC) working hard to register students. College students could have tremendous power at the ballot box, if they would only choose to use it. The youth vote — people aged 18-24 — is potentially as big as the Baby Boomers. But as a voting bloc, young people have far less impact because so few of them bother going to the polls. The good news: It’s not too late to register and make your voice heard this November. Registering is fast and easy, you just have to get it done by Oct. 22. But why wait? It takes about 5 minutes, and you can do it on your phone. Do it right now. Download your register to vote poster here. 1. If you are a native or naturalized U.S. citizen and will be 18 on Election Day (Nov. 6, 2018), you are eligible to vote. But you must register by Oct. 22. 2. You can register online. Go to https://registertovote.ca.gov/ to register online in California (or https://vote.gov/ to register in another state). To complete your registration, you’ll need to know your social security number and driver’s license or ID number. 3. You can choose where to vote. If you’re a college student who is living away from home, you can register at your permanent home address or the place where you’re living while at school. The choice is yours — but remember that you’ll be assigned a polling place near where you are registered. Where you register won’t impact your financial aid. Even if you are considered an out-of-state student for enrollment and tuition purposes, you can still register to vote in California if you live here while attending school. Your choice will affect which local issues you can vote on. 4. You can vote by mail or in-person. If you aren’t sure whether you can make it to your polling place (or if you registered at your permanent residence and it’s not nearby), request a mail-in ballot. Go to https://elections.cdn.sos.ca.gov/vote-by-mail/pdf/vote-by-mail-application.pdf, fill out the form and mail it in right away. The form must be received by Oct. 30, enough time for your ballot to reach you in the mail. You can check if you are already registered or make changes, such as updating your address, at https://voterstatus.sos.ca.gov/. If you prefer to vote near where you live on campus but previously registered elsewhere, this is where you need to go to update your registration with your campus address. Find your assigned polling station. A few weeks before the election, you will receive a voter information pamphlet that contains a sample ballot and shows your assigned polling place. You can also find that information online at your county election office or by calling 1-800-345-VOTE. Get educated on the people and issues. Want to know more about who and what is on the ballot? The same brochure that shows your polling location contains a sample ballot and a description of the candidates and issues, including arguments for and against each measure and the major organizations endorsing and opposing it. There are lots of other sources of information available. The League of Women Voters and the Campus Vote Project are just two of the many nonpartisan resources. Check your student life office for events and Get Out the Vote efforts on your campus. 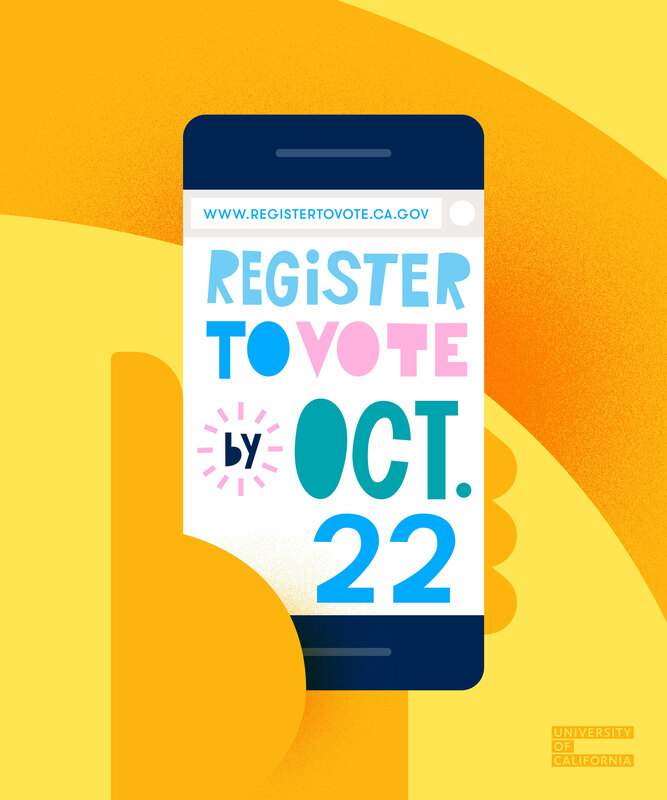 Visit California Student Vote, a joint project of UC and CSU student associations, to get information on issues and help register new voters. 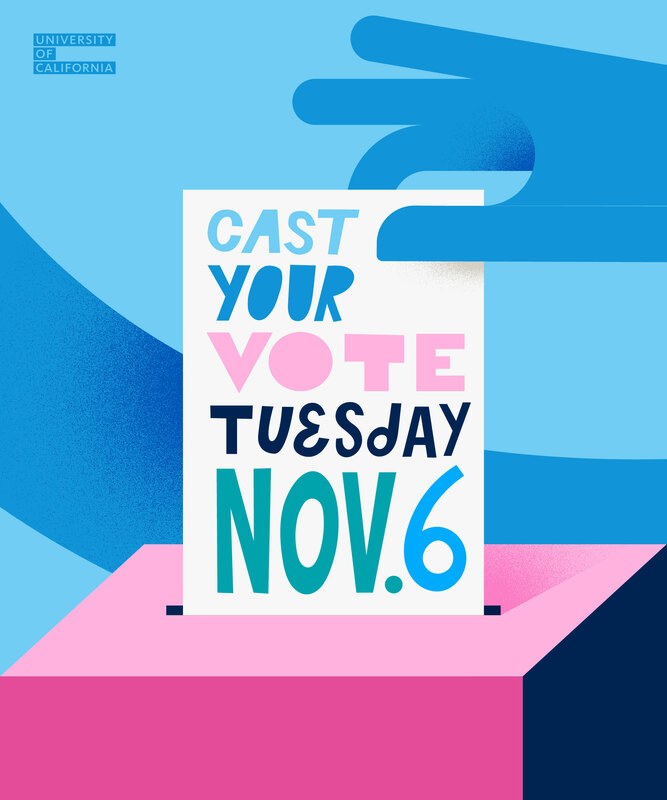 Download your election day poster here. Your vote is your voice. Be heard! Now the fun part. Show up on Nov. 6 between 7 a.m. and 8 p.m. at your assigned polling station and cast your ballot. Even if you show up at the wrong polling place, don’t worry! If you are registered anywhere in California, you can submit a provisional ballot. These count just like any other: they simply take a bit longer to tally so officials can ensure against people voting twice. If you are voting by mail, complete your ballot and pop it into the mail by or on November 6. Don’t forget postage! You can also drop it off on Election Day at any official polling station.